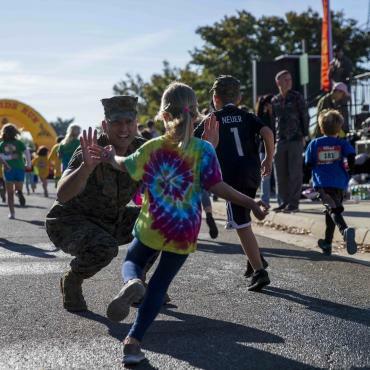 The MCM Kids Run presented by Virginia529 will be held on Saturday, October 26, 2019 in the Pentagon North Parking lot. 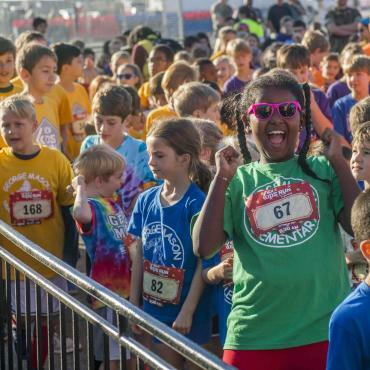 Nearly 3,600 children ages 5-12 will participate in the one-mile just-for-fun running challenge. Shuttles from Metro, post-event hospitality, activities, entertainment, games and mascots make this an unforgettable event. The forecast for Saturday includes light rain during the hours of the Kids Run. Please dress young athletes appropriately for the wet conditions. The MCM Kids Run will happen rain or shine. 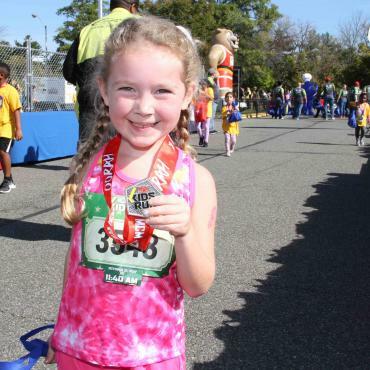 Hosted on October 26, 2019, the day prior to the MCM, this one mile just-for-fun running challenge hosts children ages 5-12. Participants may select from nine specific starting waves. An individual young runner's designated wave is indicated on the official participant bib as noted by color, start time and bib number. All participants receive a shirt, access to the Camp Miles Family Fitness Festival and a stunning medal at the finish line. Registration will cost just $10 and will open on April 24, 2019 at 12:00 p.m. (noon) eastern. 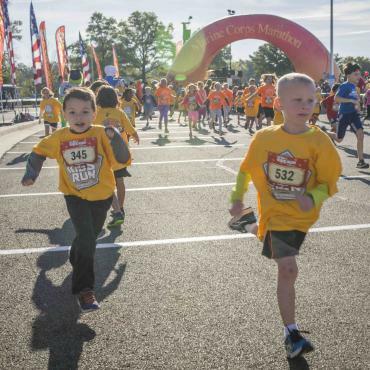 The MCM Kids Run, located in the Pentagon North Parking Lot, is an out-and-back, secure, kids-only course. 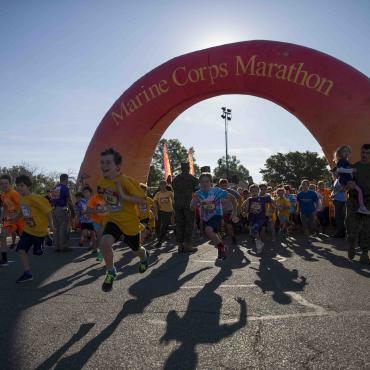 Nearly three dozen uniformed Marines are located throughout the run route as well as the Family Link Up tent, start line, and finish line to ensure all children are motivated and safe. Parents are not permitted on the course, but may run alongside their child on the outside of the bike rack along the perimeter of the course. The MCM Kids Run will launch young runners in waves beginning at 9:00 a.m. The MCM Kids Run will feature nine separate waves of 400 runners. Parents can choose the wave in which their child will participate during the registration process. All times are open to the public, however, the waves between 9:00-10:00 a.m. are largely designated for school groups. Each start time corresponds to a specific color. The wave color is featured on the participant bib. Participants may obtain the event T-shirt and official bib on Friday, October 25 at the Health and Fitness Expo, or on event morning, of the Kids Run (Saturday, Oct. 26) at the Info Tent in the Pentagon North Parking lot adjacent to the event start line. If planning to visit Packet Pick-up event morning, Kids Run families are recommended to arrive at least one hour prior to the runner's scheduled start time to visit Packet Pick-up and participate in the 15 minute warm-up and ceremony prior to each wave. Parents and children are encouraged to bring a new, unwrapped toy for the United States Marine Corps Reserve Toys for Tots Campaign located at Packet Pick-Up. Additionally, there will be a designated drop-off site for at Camp Miles on event morning. 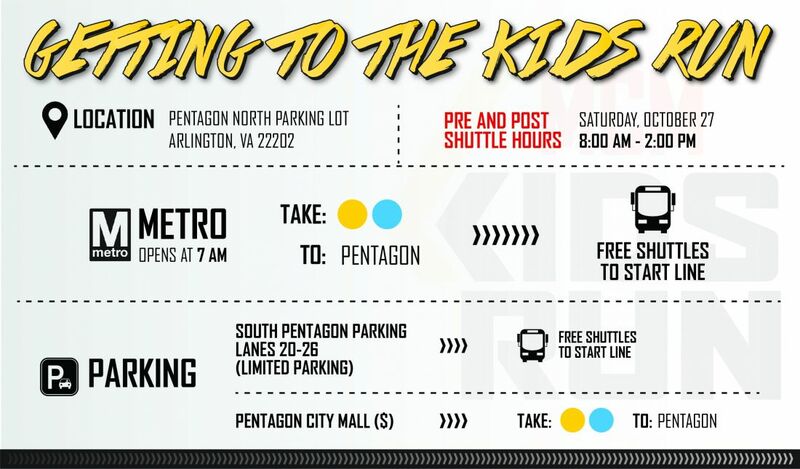 Shuttles - Utilize the free shuttle service running continuously from 8 a.m.-2 p.m. between the Pentagon Metro station (yellow or blue line) and the MCM Kids Run start/finish area. Parking - Limited parking is available at South Pentagon Parking in lanes 20-26. Additional pay parking is available at Fashion Center of Pentagon City located at 1100 S. Hayes St. in Arlington. Metro - Take Metro to the Pentagon station (yellow or blue line), then ride the shuttle to the start line. Parents must remove the Kid Claim Coupon from the runners' bib prior to dropping the child at the start line. This coupon must be handed to the uniformed Marine at the Family Link Up tent to retrieve a runner after the finish. Parents must also fill in the emergency information on the back of the child's bib to complete the check-in process. 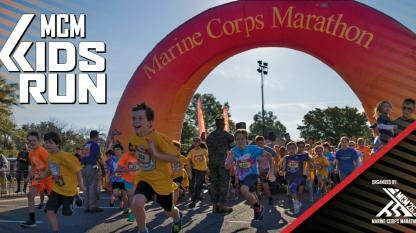 The MCM Kids Run is a closed course, reserved exclusively for young participants and Marines. 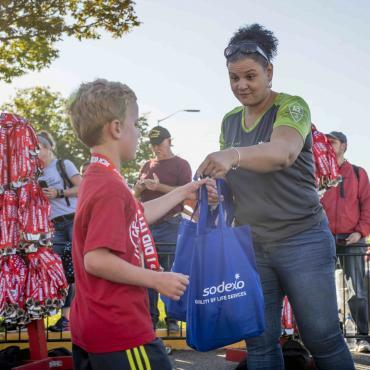 After crossing the finish, children will receive a medal and replenishment snacks from Sodexo and Dole. A peanut free option is available and children are expected to be aware of their individual needs. After receiving hospitality items, Kids Run participants will enter the Family Link-up tent. Parents or guardians can enter the reunion area by showing the Kid Claim Coupon, removed from their child’s bib prior to the run. The coupon number matches that of the participant’s bib. 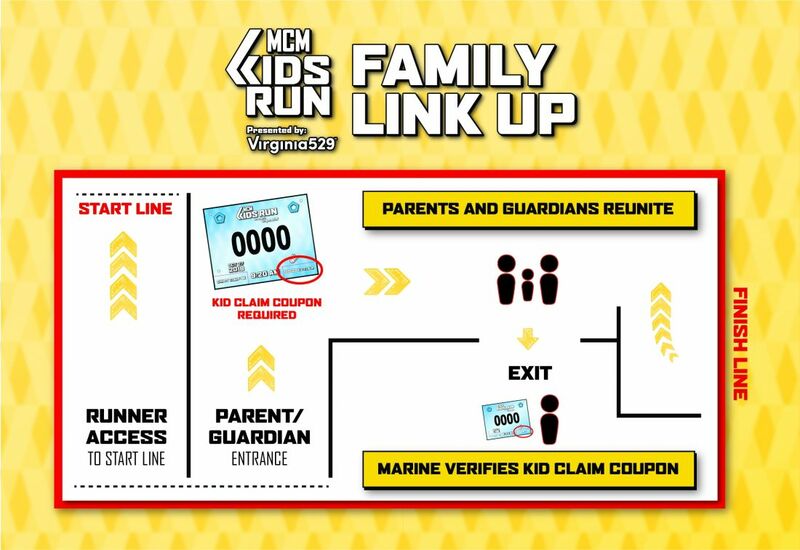 After reuniting with the runner(s), families will exit the Link-up tent by showing the Kid Claim Coupon and participant bib to Marines positioned at the exits. Parents, families and runners are invited to visit Camp Miles, a free all-day activity area featuring interactive challenges and games focusing on health and fitness. Camp Miles activities begin at 9:00 a.m. and continue until 2:00 p.m.
Activities will be hosted by Fit Arlington, Silver Diner, Famous Dave's BBQ, First Command, Virginia529, Navy Federal Credit Union, Tropical Smoothie and more! Kids of all ages will love meeting the amazing menagerie of mascots at the MCM Kids Run. Miles and Molly welcome: Sammy the Sea Otter from Navy Federal, Lift Off from Sodexo, the GECIO Gecko, Jukebox from Silver Diner, Power Panther from the USDA and Tuition Monster from Virginia529. If you are an organization or business interested in hosting an activity at Camp Miles, please e-mail the MCM Sponsorship Coordinator. The MCM Kids Run hosts school groups from the Metro DC area, many from Northern Virginia, as part of the Healthy School Award challenge. The top five schools with the most registered student participants are honored with the Healthy School Award. This award includes a monetary donation to the school's physical education department from MCM partner Sodexo. Virginia529 mission is to continue to be a national leader in 529 programs by providing superior, affordable, innovative, tax-advantaged college savings options to assist families and others in achieving their higher education goals. Born as the Virginia Higher Education Tuition and Trust Authority in a cubicle in the Department of Treasury, the Virginia College Savings Plan – or VA529 – has emerged as a premier 529 Plan in the country. Even though your family is focused on the final quarter of the school year, it’s never too early to plug an activity into the fall calendar by registering for the MCM Kids Run presented by Virginia529. For parents, there are six big reasons to register early for MCM Kids Run. 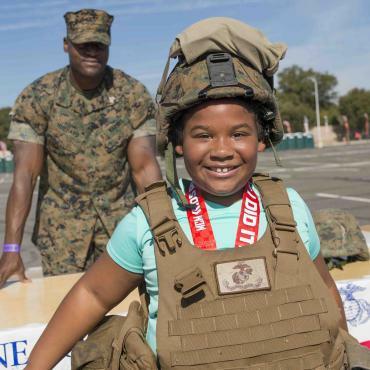 After 30,000 runners trampled down the doors of the Marine Corps Marathon during March, individuals who are motivated to run with the Marines, but at a shorter distance, are getting ready for their registrations to open on Wednesday, April 11. That's when sign ups begin for TWO favored MCM Weekend events – the MCM10K and the MCM Kids Run presented by Virginia529. To bring more families and young runners to start lines in 2018, the Next Generation Inspiration Initiative offers a 40 percent registration discount for all runners age 17 and under for all 2018 MCM organized events.